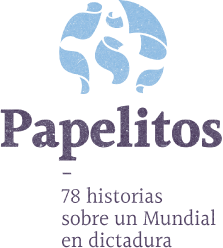 The ´78 World Cup put Argentina in the international media spotlight, which the military junta tried to use to allay the accusations against them. More than a year had gone by since she’d heard from her son when Marta Moreira de Alconada Aramburú made her way through a group of women who were gathering in front of a microphone in Plaza de Mayo. He was the eldest of her five children and had been kidnapped by state security forces. That day, Marta didn’t know that what she would say would go down in history. “We just want to know where our children are. Alive or dead, we want to know where they are. We don’t know who to turn to any more: consulates, embassies, ministries, churches,—they’ve all shut their doors on us. That’s why we’re begging you to help us, you are our last hope. Please, help us. Help us, please. 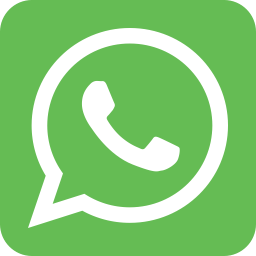 You are our last hope,” she implored a Dutch journalist who had arrived in Argentina that winter not just to cover the 1978 World Cup but also to report on the disappearances of men and women being orchestrated by the military dictatorship. Their weekly meetings to walk around the pyramid in the center of Plaza de Mayo soon became symbolic of the group and began to make waves abroad. In mid-1978, Argentina became a focus of international media attention in the run-up to the 11th FIFA World Cup, which it was to host. 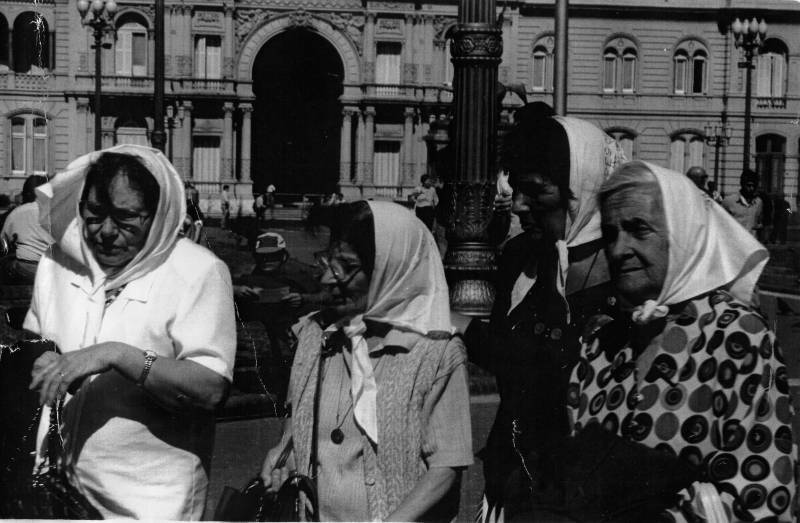 Although the civilian-military dictatorship sought to use the competition to cover up the reports on human rights violations that were already circulating abroad, the Mothers and Grandmothers of Plaza de Mayo proved impossible to silence. Robert Cox, the editor of the Buenos Aires Herald, said that one of the good things about the World Cup was that the international press would visit Argentina. “Sports journalists began to realize what was going on here. The junta tried to scare them off… but word began to get out,” Cox recalled. To the microphones one of the Mothers explained that they were there to find out where their children were. Another clarified that they wanted "to know if they are alive, if they are dead, nothing else. That they answer us". And then Marta came to the front, until then she had heard from behind the tumult. He stood in front of the camera, holding in her hands the sign that hung from his neck in which said in blue "We want to know where our children are". A patch of white cloth covers her gray hair. She looks at the journalist and starts talking: “We just want to know where our children are. Alive or dead, but we want to know where they are. They tell us that Argentines abroad are giving a false image of Argentina. We are Argentines, we live in Argentina, we can assure you that there are thousands and thousands of homes suffering a lot of pain, much anguish, a lot of despair and sadness because they don´t tell us where our children are, we don´t know anything about them. They have taken away the most precious thing a mother can have. Anxiety, because we don´t know if they are sick, if they are cold, if they are hungry. We do not know anything. And despair, sir, because we no longer know who to turn to. Consulates, embassies, ministries, churches, all the doors have been closed to us. That's why we beg you, you are our last hope. Please help us, help us, please. You are our last hope”. Then Enriqueta Maroni spoke, who claimed -and continues to do so- for the whereabouts of two of her children. Enriqueta denounced the way in which her children and the ones of rest of the women with white headscarves had been kidnapped. “They have come to our houses, they have raided them, they have stolen everything they have wanted, they have destroyed the houses, because they have destroyed them, and stolen everything we have, besides our children, and we never heard anything from them again. The Army has done that”. That afternoon, in addition to the foreign media, the Buenos Aires Herald was present. For that newspaper, the meeting between the international press and the Mothers of Plaza de Mayo was news and they printed it the next day. 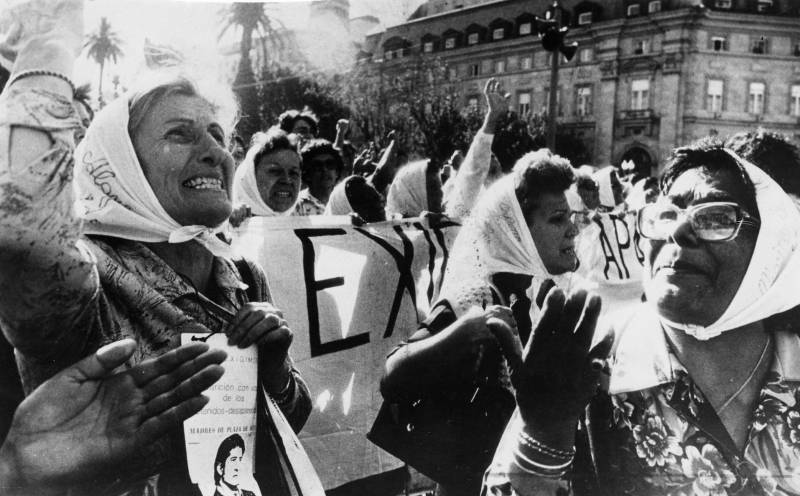 In an article entitled “TV Workers Films Mad Mothers” they reported that the "mad mothers of Plaza de Mayo" received massive coverage of Europe's television media. The article mentions that the round of the Mothers in front of the House of Government was filmed by Dutch, Belgian and English television groups. They also mentioned that photographers from foreign publications had arrived. And when the journalists began interviewing the mothers, "two patrol cars" appeared, "the uniformed police approached the scene but remained watching from the edges." And then, plainclothes police "intervened". Dutch television recorded a policeman insisting mothers to "circulate" through the square, telling them to stay still. They never did.